Scholarly engagement with the magazine form has, in the last two decades, produced a substantial amount of valuable research. 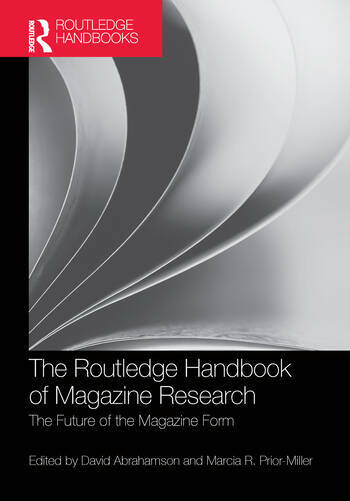 Authored by leading academic authorities in the study of magazines, the chapters in The Routledge Handbook of Magazine Research not only create an architecture to organize and archive the developing field of magazine research, but also suggest new avenues of future investigation. Each of 33 chapters surveys the last 20 years of scholarship in its subject area, identifying the major research themes, theoretical developments and interpretive breakthroughs. Exploration of the digital challenges and opportunities which currently face the magazine world are woven throughout, offering readers a deeper understanding of the magazine form, as well as of the sociocultural realities it both mirrors and influences. -Methodologies and structures presents theories and models for magazine research in an evolving, global context. -Magazine publishing: the people and the work introduces the roles and practices of those involved in the editorial and business sides of magazine publishing. -Magazines as textual communication surveys the field of contemporary magazines across a range of theoretical perspectives, subjects, genre and format questions. -Magazines as visual communication explores cover design, photography, illustrations and interactivity. -Pedagogical and curricular perspectives offers insights on undergraduate and graduate teaching topics in magazine research. -The future of the magazine form speculates on the changing nature of magazine research via its environmental effects, audience, and transforming platforms. Contributors: David Abrahamson, Dane S. Claussen, Elizabeth Crisp Crawford, Michael Dahlstrom, Hanna-Kaisa Ellonen, Bill Emmott, Kathleen L. Endres, Vincent F. Filak, Cheryl Renée Gooch, Susan Greenberg, Michael Heller, Elizabeth Meyers Hendrickson, Carol Holstead, Berkley Hudson, Anette Johansson, Elliot King, Carolyn Kitch, Helen Kopnina, Elizabeth A. Lance, Dominic L. Lasorsa, Carolyn Ringer Lepre, Kim Martin Long, Miles Maguire, Rachel Davis Mersey, Cynthia Patterson, Abe Peck, Marcia R. Prior-Miller, Bill Reynolds, Leara Rhodes, Yanick Rice Lamb, Lulu Rodriguez, Michael Rowlinson, Sela Sar, Carol Schwalbe, Isabel Soares, Ted Spiker, Ken Waters, and Sheila Webb. David Abrahamson is a professor of Journalism and the Charles Deering Professor of Teaching Excellence at the Northwestern University’s Medill School, where he teaches courses exploring the changing nature of long-form journalism. He is the author of Magazine-Made America: The Cultural Transformation of the Postwar Periodical and editor of The American Magazine: Research Perspectives and Prospects. Marcia R. Prior-Miller is an associate professor emeritus of Journalism and Mass Communication at the Greenlee School of Journalism and Communication at Iowa State University, where she led the magazine program. She is the compiler of the Bibliography of Published Research on Magazine and Journal Periodicals, now in its 9th edition, and serves on the editorial board of Journalism & Mass Communication Quarterly.